Dublin’s Newbridge House and Farm – which bills itself as Ireland’s only intact Georgian mansion and estate – has launched its new immersive ‘House and Farm’ experience. New operators Shannon Heritage, in partnership with Fingal County Council said that the experience brings the story of the 18th Century big house to life, and also features a 30-acre traditional working farm with a range of animals to visit. It is home to Shetland and Connemara ponies, pigs, goats, bunnies, and birds. Baby chicks are born daily year-round in its hatchery. Shannon Heritage, which is Ireland’s largest commercial operator of tourist attractions, says further development plans have been approved for funding from Fáilte Ireland to transform the visitor interpretation areas in the basement of the Newbridge House. 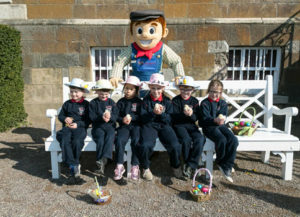 Newbridge House and Farm in Donabate is the latest attraction to join the Shannon Heritage portfolio of eight day visitor attractions and four evening entertainment experiences, including Bunratty Castle & Folk Park, GPO Witness History, Malahide Castle & Gardens and King John’s Castle. Children from Dunsany National School with Farmer Joe and new born chicks in Dublin’s Donabate at the launch of Newbridge House and Farm’s ‘House and Farm’ experience. The house dates back to 1747 when it was built for the then-Archbishop of Dublin, Charles Cobbe. The house now features a Museum of Curiosities. Created in 1790 it is a one of the few remaining family museums in Ireland and Britain filled to the brim with antiquities and oddities. Among these are Captain Cook memorabilia, fossils, taxidermy, exotic shells and a collection of 19th century Indian souvenirs collected by the family. The house has also been the filming location for movies including The Spy Who Came in from the Cold and the Oscar-winning Barry Lyndon.